One of my favourite parts of Christmas day is sitting on my bed first thing in the morning with all my girls, rummaging through our stockings, finding lots of lovely goodies from Santa. You may remember a while back, I reviewed some gorgeous bandana bibs from the lovely people at Funky Giraffe. 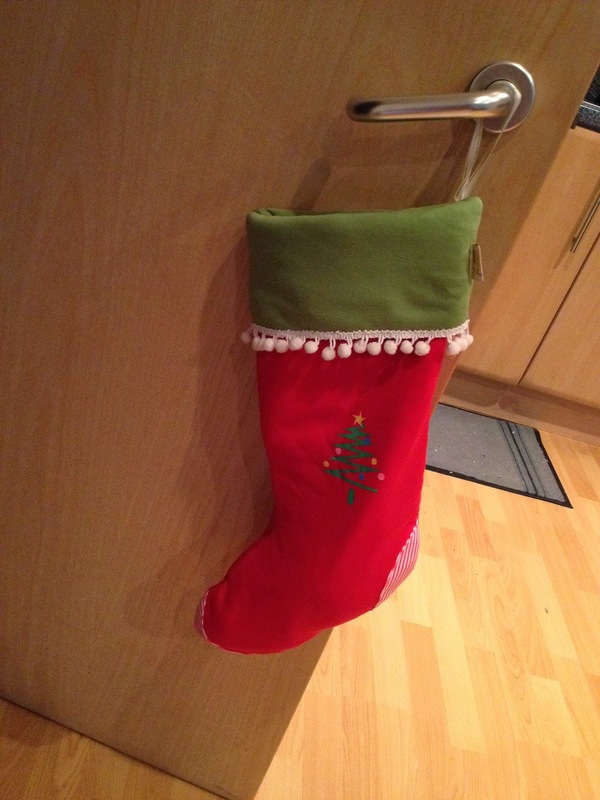 Luckily for me, I have been given the opportunity to review one of their new Christmas stockings. When it arrived I couldn't believe just how soft it was, it was lovely and thick, very quilted. In stunning bright red and green colours, just perfect for Christmas. Ours came with a Christmas Tree motif designed on it and the added pom poms and tassels around the top of the stocking and the added patch details at the toes and heel were a really nice touch. There are two other designs which you can choose from, a snowflake or a 1st Christmas one. Each one just as stunning as the one above. What I really love the most about this stocking is that it is made to last. Other stockings that I have had in the past have been made of very thin material and if you put anything too heavy in them, then they end up ripping. I can see the Funky Giraffe Christmas stocking being used year after year. You can fill it from the tips of it toes, right up to the top, plenty of room for whatever stocking fillers you choose. With a loop of ribbon already attached, it is ready to be hung wherever you choose, really wish I had a fireplace to hang ours above!! This stocking costs just £8 with free postage, a bargain in my eyes for something that will be used for many Christmases to come. And for just £2 extra you can even have it personalised. Whilst on the topic of stockings, what do you fill your childrens stockings with?? Disclaimer : This stocking was sent to me free of charge for reviewing purposes however all thoughts and opinions are my own.